I came to Ghana from nearly a month in Liberia in late May 2013, working with at-risk girls. I had 2 years of experience in Liberia as a former Peace Corps Volunteer in the late 1960's. This trip I planned to travel to Ghana to join a Rustic Volunteer program that I had been planning for 2 years. It was my 3rd time in Africa in the past 44 years but my first time in Ghana. To my great disappointment, my planned project fell through after I reached the Accra area. But by the great diligence of the Rustic staff in both the US and Ghana, I was directed to another program that could not have been more suited to me. My idea in the US was to teach girls to sew tote bags of African cloth. The Hohoe area-lush green and much cooler than near Accra-was ideal. The people were friendly, and my project was perfectly suited for me and near my initial intention-working with Street Girls (ages 16 through 19) who had babies but no husbands or jobs. The goal was to teach them enough sewing skills that they could sell their bags at the market. I worked through a school that also includes the children of street girls among its students. I taught the girls to sew tote bags out of African cloth, including using scraps. I brought them from hand-sewing cloth flowers (which were later used on their bags) though scrap sewing of bags, to fancy bags, all out of African cloth. A local seamstress assisted me with sewing techniques and language issues, although the girls all spoke a fair amount of English. We worked for 6 weeks, giving those hand-crank sewing machines a run for their money! Since babies were often secured to their mothers' backs with African cloth, the girls had to stand up at the machine to sew at times--no small feat. I got to know the girls, their babies (whom I held whenever possible and helped to nap on mats on the floor of the classroom) and school children and their teachers and helpers, including becoming buddies with the ladies who served lunch to the little kids. I loved those little school children and their smiling faces. I even extended my stay to work with the older class and show them Power Point slides of typical" life at home in the US. Since the classrooms were open-air, I got to know most of the little kids in the school, who would crowd our classroom whenever possible to see what we were doing and get me to take their picture. Occasionally a chicken would wander in, or our toddlers would wander out and have to be corralled and brought back into the classroom. Even after the class session was over, the girls would come to my hotel with the babies to give me bags they had sewed after we were finished at the school. At times I would meet them and their babies on the street, with lots of smiles and hugs. We all became very fond of each other. I plan to work through my women's professional organizations at home to support the girls and get their children enrolled in this school so they have a chance to get ahead in life. I will remain part of the program in the coming years even at a distance. And that is just the school project! Although this is a city of 60,000, it does not feel that big. People on the street are very friendly if you say hello. I had 2 favorite cloth stores, a favorite fruit vender (fresh pineapple, mango, and watermelon can't be beat! ), friends at the internet store, and became very close to an elderly country woman, Felicia, and her family. Felicia's family invited me to meals several times and gave me a beautiful dress they sewed of African cloth that totally matched my favorite color, design, and style without their even knowing my taste. Felicia and I became fast friends even though we have only about 10 words in common. I spent many hours sitting at her shop and just enjoying being with her and her adult son who is a skilled mask carver. As I was about the leave, I went around town saying goodbye. It doesn't take much to become friends with strangers or to have you and them sad when you leave. Since I left this afternoon, all 3 members of this family have called me to say how much they miss me, and another friend passing through at the hotel has done the same. My 2+ months here have been marvelous. It is really hard to leave Ghana and my wonderful life here. When I would go to shops where my favorite proprietors were absent, their helpers whom I had never met would say, Are you Alicia?" This is what you get when you throw yourself into the experience and just enjoy yourself. And my project mentors have been with me every step. 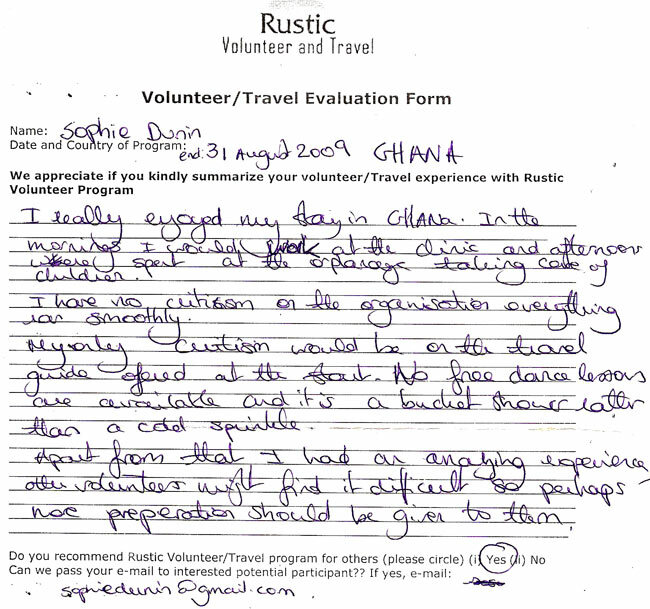 But I have enjoyed it so much that I have signed up with Rustic Volunteer for a month in Kenya after leaving Ghana. I will work with similar sewing project s with Maasai women who I first met 45 years ago on vacation from the Peace Corps in Liberia. I look forward to this part of my adventure and expect to have wonderful experiences there, too. 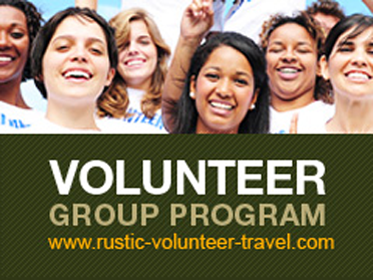 I know the Rustic Volunteer staff in Kenya and the US will make sure I have a great trip and accomplish what I wish to. I am sure it will be as hard to leave Kenya as it is to leave Ghana. At the age of nearly 70, but young in body and mind, I cannot say emphatically enough that this experience is wonderful for anybody regardless of age. Although I have not hiked the steep trails, I did an hour walk each way through the jungle to see the spectacular water falls, and also walked 30 minutes each way in the jungle to experience monkeys landing on my arm and peeling and eating the banana I held, babies on their moms' backs. This experience is what you make of it, and I found something fascinating at least once every day. 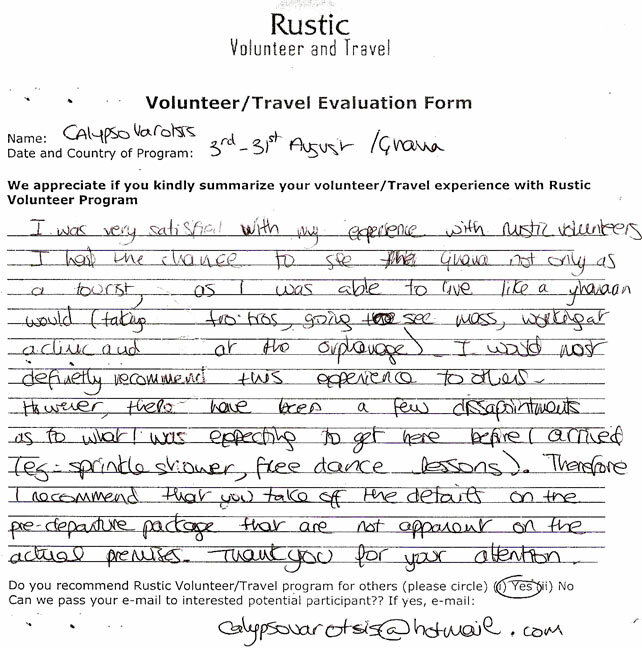 I would give Rustic Volunteers a 9.9+ out of 10.